Does not appear to be compatible with older IPads. No sound. Good for 60 minutes actually not two hrs. 60 minute cardio extreme from P90X workouts that u can look at there workout sheet and type it in the seconds pro. I love the app, but lately the volume will fade out after 3 Seconds On my Timer even if there is more text there. Not sure how to fix it. I’ve been using this gem of an app for a few years now. I couldn’t be happier with the ability to tailor my workouts to fit my needs. I use it primarily for an HIIT type of workout on a Versaclimber. I highly recommend this app for those of you wanting to enhance your ability to achieve your fitness goals! Good for looking at P90X and P90x2 on the web and back and forth when typing it in!! And insanity! Great App. Easy to use and very intuitive. I use it almost everyday. It would be great if it could sync with streaming services like Spotify. This app is great and has many options. I am hoping they add the beep test in the future. The app consistently dysfunctions. I had to re download and was charged twice. Disappointment. No customer care to follow up with. I have had this app on and off over the past two years. I downloaded this about a month ago and input my timers. At first it would make me wait before I could use the timers now it won’t let me use a timer more than once without paying. Forget that, I’ll find something else. I use this app for my timers for all of my workouts. I do two different core workouts one on odd days the other on even, a stretching routine, a cardio workout and a strength circuit. After programming the timers I just start my music, start the timer and go, much better than the stop watch. I can even share timers with friends. Great app, just what I needed. This is my favorite workout app! But the last update caused the preparation interval to stop working. Please make that work again! The Preparation Interval no longer works. In this latest update the preparation interval stopped working. Please fix it. Upgraded to advanced for $5 and bought the pro for $7 and it still does not work with the Apple Watch. New timers get added but you can’t actually click into them. There also isn’t an email for the Company, just a reddit page which is insane to me. I want my money back or someone who can fix this. I have tried lots of apps but Seconds Pro is the Best App for 7 Minute Workout. Specially if used on an Apple Watch. This is exactly what I was looking for. If there’re any improvements to be made, I can’t think of what they might be. This is awesome. Why buy a bunch of apps with different interval sets that you can’t change? With this app, you can design your own programs and cue your own music. Takes a little time to figure out, but it’s not much harder than programming your microwave. I can’t find anywhere in the settings how to get rid of the click sound even if the sound is very soft. I have used Seconds Pro for about 2 years. It is highly versatile and easy to use. It's easy to design your own special timer. Whatever your needs, this one will do it. Highly recommended. I use it paired with my Polar Bluetooth heart rate monitor. Another year of use, it's well worth the small cost for the pro. You can design a timer for any routine you need. I have now used Seconds Pro for about 4 years. It continues to be a great choice for a timer. It is very versatile. It’s a great app. It takes all the guess work out of your workout. If you want to rest for 30 seconds. You can do so without looking at you watch every 5 seconds. The custom workouts as well as the preset workouts are awesome. Just an awesome app all the way around. I've been using Seconds since version 1, and it's been one of my most-used apps for years. I've tried at least 6 different apps and Seconds is the only one with the versatility, stability and ease of use to work for all my needs. I use it to time several different types of workouts, music practices and other miscellaneous tasks. The display is easy to read, timers are easy to set up, manage and organize. It's an excellent app. It’s also the only one I’ve found that consistently beeps when other apps are in the foreground, when the phone is in vibrate mode and after receiving a phone call or certain other events on the phone. I have used this app for 8 years now. As my exercise routines change and evolve this app has remained my mainstay because of the intuitive and flexible design. I absolutely love it! I use it daily to help time my workouts and keep me on track. 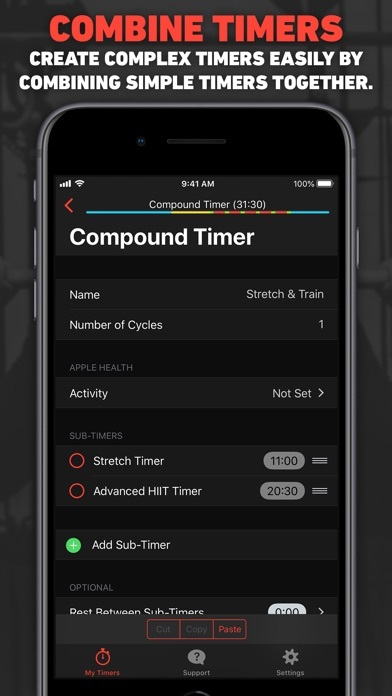 Compound timer is your friend to build up the workouts of varying exercises, groups and sets. Rest and transition times can be easily programmed in. While in the workout, pausing or going back a bit is easy if you run over time for a set. A quick tap does it! Clear text to speech instructions are my fave so I don’t have to keep looking at the phone. Best $$ spent ever!! Most other fitness trackers are run-oriented. This one is perfect for kettlebell, EMOM, heavy bag intervals and other timers for my style of workouts. The latest update is giving me a “0 discounts left. Please upgrade before your trial runs out” warning. I’ve clicked the warning and it says “fetching” but nothing happens. Since I purchased the pro version and have years of workouts stored, I’m not certain why I’m getting this warning or how to further upgrade from pro. I’ve tried to find an email (customer support used to have one in the app), but wasn’t able to, so I’m posting here. Please advise! It sure how to program this. I use Seconds Pro in our box whenever someone’s already got our Rogue Echo timer in use. One improvement I’d like to see is the “preparation interval” always countdown regardless if you have your main display counting down or counting up. I also think the preparation interval shouldn’t be counted in the total time elapsed. It’d also be nice if you could configure the display by timer rather than it be a global setting. That way my AMRAP timers could be count down and my For Time timers could be count up without toggling the settings before each workout. When I add a music playlist in workout or rest phase it doesn’t resume music from where you left off. So you listen to the first 20-30 seconds of a song over and over. Even when you turn on resume. There is no way to get support other then getting a reddit account and hope and pray someone sees the post and can answer it. If you want to add your own music. This isn’t it. Great app. Easy to use. Love using my own music. I just have to say it again-I LOVE this app! Months later and a few updates, still love this app. Just discovered the “cadence” setting - was using a metronome app to set my cadence for my walks, pedaller, and stepper. Glad to see it’s all in the same app! Years later, I still love this app! I use seconds pro to run my Bootcamp classes I teach. It’s great except it occasionally glitches out and reboots right in the middle of class. Hopefully they’ll fix the glitches. The interval features do not work on my Apple Watch (echoed by many other reviews). As soon as the Apple Watch screen turns off, the timer features stop. As there is currently no way to force the Apple Watch screen to stay on, this makes it impossible to use the interval app as intended. On the other hand, the app works great when using on my iPhone. Such a bummer that it has such poor compatibility with the Apple Watch. Bought this app because of the Apple Watch functionality but there is no cross-functionality with your iPhone. If I start a workout on my Apple Watch I do not get the audio cues through my headphones only some haptic on my worst. If I start on my phone I get the audio cues in my headphones but I don’t get the Health data from my Apple Watch. Very disappointing, I won’t be using this app. Phenomenal app, BUT drains the battery. I ran it for 2.5 hours today and it drained 40% of my battery. Would be nice if I could customize the right/left split, but overall a well designed app. I’ve been using this app in my group fitness classes for the last 2 months and it meets all my needs if I’m controlling it using my iPhone controlling this app using the Apple Watch is almost impossible, you cannot scroll through and start any of your preset timers as the timer screens just constantly flashes, which is why I rated is 1 stars. I planned to only use this from my Apple Watch and am disappointed that I’m not able to use an app that I paid for. Upon fixing the Apple Watch features is this app It would be a 5 star rating easily. All my timers are gone! I was so excited to use this app. I bought the pro version so I could set up timers and have a quick go to workout. I spent hours setting up different timers. The app completely deleted all of them. Also, the timers I created don’t show up on Apple Watch. Worst $5 I have spent in awhile. The best timer I’ve found for interval training. Well worth it! We use this app for our water aerobics class. With some of our favorite music and the app announcing our exercises we breeze right through our class time. So glad a friend recommended Seconds Pro! Good for 2 HRs with cardio/Strength mixed in! Also 1:05 Second rest in between the Circuit! Support forum 404s. There does not seem to be able to remove the 10 second warning. I like how I can make this app work for me instead of trying to fit into someone else’s routine. I am not the most tech savvy middle aged woman, but I figured this out very quickly. Worth the $$. Elapsed time, can't start from where I left off, starts counting from zero. When the app quits I want to fast forward to where I left off. This app won't. How come I don’t see any difference between the pro and regular. Been using the regular for almost a year now. Then I downloaded the pro but after browsing i found out it’s all the same. Can anyone help me? Simple to use and lots of options. Don’t travel without this app if you are committed to staying fit! Once a week or so I’ll build a new routine, and now I have a great library of workouts that vary based upon time. Now when I’m on the road, I’ll choose a workout based on time available. Thanks for a great fitness tool!! This app is the perfect interval timer!! Great features and flexibility to build the exercise timers you need, plus great support from the developer. Get this app! App seems great but it crashes on my Apple Watch. Pro version is worth the money. I love the new "count up indefinitely" feature which gives you time to combine timed cardio intervals with counted-rep intervals. I paid for this app specifically do to interval running with my Apple Watch. At first it worked perfectly! I was so excited and raving about it to my friends, but now the timer pauses when my watch face turns off as I’m running. I tried to look online for help instead of writing a review but they don’t make that easy either. So, If there is a setting I can change to stop this from happening please let me know! Because if not, I have absolutely 0 use for this app. Please help. The beeps never work after first round interval?? Great app, well done. Please update to fix the Watch App on WatchOS 4.3, which now crashes on launch. Will update to five stars when fixed. This timer is so easy for me to setup all my gym routines with intervals, spoken word etc. In addition, and this has happened in the last 6mths, the developer has improved the Apple Watch timer such that I use it every day. Each morning I get up and do my stretches after showering. Initially with the old watch OS all timers got recorded by apple as exercise (rings, etc) but now I can have my stretches not count to this time (just changed category). Its great as I have my watch on taptic and not ring so my wife is woken up when I do the stretches. As of today-4/10/2018, this is the best timer I have ever seen. Love this app!! For my 2 Hour cardio/Strength With 1:04 Second Break In between and 1:00 intervals! March 2018 Review Update Have now realized that the app also easily connects to a basic Polar heart rate monitor. Add this to the total flexibility of the display layout, I now have the perfect device for interval training on my Nordic Trac. The electronics on my NT, which is over 20 years old, died many years ago, but Seconds Pro is obviously even better. I've been using the free version for several years for everything from timing stretch routines to timing steaks on the grill. I never thought I needed the pro version. Recently I thought I had identified a bug so I sent the developer an email, what did I have to lose. Not only did I get a personalized response confirming that the latest iOS version was causing a problem, but they also invited me to be a beta tester of the corrected Pro version. Even the free version has so much flexibility and functionality available as far a setting up various routines, all of which you can use without looking at the app, as the text to voice capability is excellent. I'm now ready to set up and refine all of my routines, which because I have the Pro version I can now save. Like I said I've use the free version for years, but if you use a timer regularly, I highly recommend forking out the money for the paid pro version. You will be glad you did. Revising my previous review where I complained that setting up my own customized run walk timer wasn’t intuitive: I finally stumbled on the way to do it (click on the pencil). I think for most users this would be easy, but I was rushed and do not use a lot of apps, so was slow. App works well. Thanks for feedback from the developer. I have been using this app for a few years now for everything. Routine organizational and workouts etc. But recently it hasn’t been cooperating with the Apple Watch to get my heart rate for some of my workouts despite the fact that I have an activity assigned to it and Apple health/Apple Watch enabled. Please help me fix this. Also, could we get some app sync between iPhone and Apple Watch so you can have a workout diplay simultaneously on both devices. It would be really helpful for doing the workout with the watch but hearing the audio cues from the phone (as the watch does not do audio cues to my knowledge, it just vibrates). I will gladly make this a 5 star review once this bug is fixed! It’s good for me for only 64 Minute Workout! Like burpees 17, mountain Climbers 40 Reps, high Knees 1 Minute, tuck Burpees 12 Reps etc. very good app!! After spending 45 minutes trying to figure out why it wouldn’t run on Apple Watch in the background, and LOTS of trial and error and forum research, I learned that Apple Watch won’t support two workouts running in the background at the same time. So it doesn’t work if you try to turn on any Apple Watch workout. That said, it runs perfectly on its own and even better, records as a workout in the Apple Workout app. Note: I had to program my HIIT/TABATA workout as a Circuit in order to record the correct seconds of high intensity/low intensity/minute rest for 5 sets. I bought this because I thought I could use it on my Apple watch without carrying my iPhone on a run. It didn't work. Unless I kept turning my wrist to keep the application showing on my watch it would go to sleep and forget the timing. Works great with the phone in my pocket. Love this app. Your missing out if your not using it! 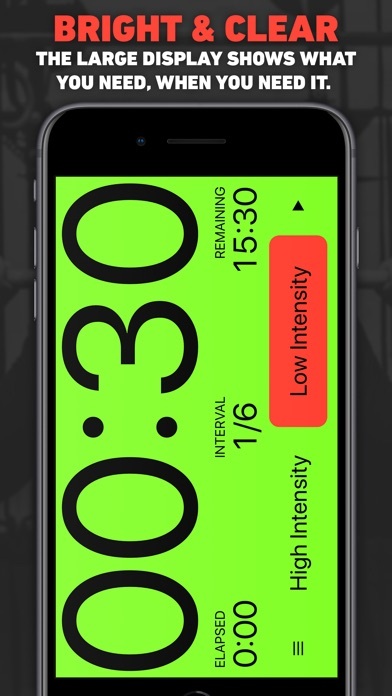 Great app for building all types of custom workouts. Tracks energy burned and heart rate. Integrates well with Health. For such a small dev team they never cease to amaze. This is the best cost personal trainer I could ever have. So easy to create and store workouts and set up monthly routines. Plus it’s great to look at! Unmatched. Update feb 2018. Just another quick review to prop up my favorite workout app. Can’t imagine trying to stay fit and motivated without it. Super! I never thought a simple timer could have so many features. This one does everything I need and a lot that I’m not sure about yet, but it’s given me ideas. It is simple to use for the basics, but could easily need an owner’s manual to lay out the number of advanced options available. This app is incredible and has changed my workouts. Every detail is so well thought out and completely polished. I’m really blown away. I’m now looking for ways to integrate the app into other parts of my life (Pomodoro timer, cleaning routines, you name it). Thanks to the developer! Was working well for me but one day the haptics didn’t workb for my apple watch; I tried to reset it - huge mess. Not worth the upgrade whatsoever. 1st review I have ever done. Feel I need to support this. Best timer I found have been using for multiple years. Cutting edge. With straight up user interface. Problems get fixed. When I think I wish I could do this, wish comes true. Please never go away. Great timer! Worth the $ I love the boxing timer and how I can customize or use the timers already given on the app. Worth every penny for the upgrade. Can be a little complicated but once you figure it out you can make any workout. This is the best app I've used. It makes my Tabata and circuit workouts easy to organize and perform. Love Seconds Pro!!! Configurable to almost any type of workout, half-way notifications, countdowns, and add your own music. I really like the it has templates so you don't have to create a workout from scratch and the ability to color code sets and workouts. The best timer out there. Hands-down the best fitness timer on the market. I am a professional fitness trainer and have been using this app for over two years. I started off using the free version and found that I needed all the features that were offered with their paid version. This app is worth every penny, and would have been willing to spend more because it's just that good. I also have clients that have purchased this app so that I can send them my workouts which adds additional value to this app. If you're looking for a great timing app look no further this is it! This is the perfect app for timed or interval workouts. I love that I can run it on both, my iPhone and iPad or I can even leave my phone behind and run the timer on my Apple Watch. Easily the best timer app I've come across for implementing HIIT at the gym. Yes apps cost money, support the developer and buy this app! Clean interface, easy to edit workouts, fun to show friends and family! Love using this for circuit training, wouldn’t use any other app! This app is hands down the best timer app for any purpose. It is infinitely customizable, reliable, and support is outstanding. It is worth every penny. I can customize my own workouts which makes working out fun. I am more motivated having timed exercises to keep me on track for the duration of my workout. Latest version of iOS. It won’t let me start a timer anymore. Edited: I’m a dumb dumb. It does work. My settings were just incorrect. Excellent app!! Love the ability to customize. Thanks! The ability to copy and paste make creating new timers easy in the fly. Very easy to use and customize. Both free and paid versions are very good apps. Functional with lots of options and an easy to use interface. Awesome timer that not only keeps your time it tells you the next exercise. Easy to set up a variety of timers for EMOMs, Tabatas of various times, AMRAPs etc. couldn’t ask for a better timer. Very easy to make custom timers. This app allows custom intervals to be created. I’ve found them very useful for doing HIIT interval training on my indoor cycling trainer. I love it! So much easier than starting my timer every minute. Once I have my workouts all set I just click play and it tells me what to do and beeps when I need to switch exercises. Perfect timer for what I need. I had this on my iPod for several years, un-updated, and loved it because it used real people for the voice prompts. That iPod broke and I downloaded the newest version onto my phone. I was disappointed to learn that somewhere along the way they got rid of that and use the Siri-like voice instead. App is still a win, just not the best. Edit: The voice prompts/count down and music is still buggy but they are working on it I think. I've used this app for over a year. At this stage I wouldn't be without it. Just perfect thanks. Love Seconds Pro. I use it for workouts that I get from various sources. I love having my Workout Playlist as background music, especially with the ability to shuffle songs. While there is the ability to sort or organize by length or title, I wish I could organize workouts into different folders for the type of workout. This would make it easier to find what I’m looking for. One glitch I’ve noticed is if I pause the workout and then hit play to resume, the song will finish but does not automatically go into the next song. I have to close out the workout and then restart it, scroll down to where I left off, and then hit play. Otherwise I really love this app! Love using this app to organize my workouts! It’s great that you can share workouts, too, though I wish that feature was a little more intuitive. This is the best timer I have ever used. With the pro you can save all of your routines so it is worth what I felt was a minimal cost for what you get. I like that I can use this on my iPad so I can use the timer without my glasses. Excellent program!!! I️ don’t usually pay for apps. I’ll go the cheap route and get the free version. But I️ said whatever and just bought the pro version. A favorite YouTube of mine (Whitney Simmons) recommended this app to her followers. I’m so glad I️ took her advice. This app makes doing circuits so easy, you just set up the intervals you want and get to work. I’ve tried a few different apps and I appreciate the simplicity of this timer. Seconds managed to do this without sacrificing features either. Solid app for my purposes: cycling intervals and lifting circuits. Beautifully revised for iOS 12. Still the best timer I've seen. Love the customizable workouts, the 10 second lead in, and playlist integration. I've been using SecondsPro for nearly two years now as a group fitness instructor. It is customizable down to the interval level which is perfect as I like to design my own classes at a very granular level. It has also been completely reliable which is a must when you're standing in front of a couple dozen people expecting a professionally run class. Cut, paste and duplication features make it easy to build on timers you've already created and the export feature permits you to share timers. This is professional grade through and through, and only gets better with frequent and useful upgrades. Highly recommended. I use Seconds Pro for anything that I need to time on a regular basis, from workouts to mindfulness sessions to cooking. Syncs to Apple Watch, tracks calories and makes following work out so much easier! Straight forward, easy, awesome. It seemed hard to find something as simple as this, they nailed it. I’m a fitness instructor and use this all the time! Haptic and Audio “3 2 1” countdown at the end of an exercise is not working in this version on Apple Watch. Update: The problem appears to be isolated to the quick timer. Timers created on the iPhone work, quick timers lack the haptic and audio “3 2 1” tones. This is the most comprehensive timer app that I’ve ever used. I’ve been using this timer within two mounted iPads in my facilities. It allows customized timers capable of handling any turnover timing needs your workouts my require. I highly recommend this app to any one who seriously creates fitness programming. I just wish their other app Heavy Set was on the iPad already!!! Was working fine and now after some sort of release rhat wasn’t tested, the text to speech with count again has stopped working correctly. This is at minimum the second time that I have reported this bug after a release. Given it was a previous known bug, I would expect this would have been tested before a subsequent release. This has to be in the top 10 of App Store apps. We use it very frequently for basketball practices and it helps keep us on task. The developers make frequent updates. Update: anyway to add an auto iCloud sync option in the settings? Great job! For such a small dev team they never cease to amaze. This is the best cost personal trainer I could ever have. So easy to create and store workouts and set up monthly routines. Plus it’s great to look at! Unmatched. Provides so much for so little cost. This is a great app that’s proven its worth time after time. It’s my go to app for implementing exercise programming. The versatility it offers is astounding and likely more useful beyond the scope of my use. You would be well served by it, no doubt. This app is versatile and performs great! Use it in the weight room with 30+ athletes working out as well as for my own personal use and it is hands down one of the best apps I’ve ever purchased! I use this for teaching kickboxing and it is awesome! Continuous improvements. Developer very responsive. It’s my go to timer and always recommend it to my friends. Use it most days for my workouts. I use the paid version and am very happy with the app. I have been using Seconds Pro for YEARS and love that I can have numerous timers for different formats. Just yesterday while instructing a class I noticed that as soon as the timer begins to beep, my music volume goes down. That is quite annoying when I’m on a 30/10. What happened??? This App takes some effort to understand how to use, because I could not find a manual. However, once I figured out how to use the features that I needed, I liked it. I still am not using all of its features because I cannot figure out how to use those features. Has all the features I need, and is mostly Intuitive. You can create custom timers, load pre-set timers, and even sync it with your music or have your music playing over this app in the background. I love how I can make all my own different timers to suit my workout style that day. I love this app. Makes running or biking intervals so much easier. I never have to look at my watch for time because the beeps tell you when it’s time to change pace. It’s also easy to create your own timer workouts. It has been well worth the price to me. Seconds Pro is the only workout app I have ever used with any kind of consistency. I found myself going to a few boot camp / HIIT kinds of classes. I knew I could do these workouts on my own but the issue was always trying to watch my timer while doing the exercises. Second Pro solves this problem and then some!! Love this app. The app itself is very functional and after a brief learning curve you can build the timers that you need. However, even with premium edition, WAY too much personal information is collected and shared (I read the privacy policies) with limited options to control, so I have deleted the app. If this doesn’t concern you, you will find the app useful. I am a musician, and I use this app as a tool for organizing my practice time. I love that I can preprogram my run/walk intervals with warm ups and cool downs. Being able to customize my music is an added bonus. I can go on my run without watching the clock. Excellent app to keep you on target with workouts and keep you moving. Set it for any intervals or any kind of workout from body weight to lifting weights. If you want to get a good workout, use Seconds Pro. Before this app I rarely did tabata, so easy w the app I've rediscovered their value. Tons of customization possible. Best app for Spartacus workout ! I really like this app. It lets you customize practically everything you would want to customize from workout times to alerts rests and more. I started with the light back in the day and the pro is definitely worth purchasing if you want to save a ton of workouts. Timers take you to another level when set properly. I recommend this app to all of my friends that want something to hold them accountable at the gym or working out at home. Perfect for garage gym functional training and traveling! On my phone and ready to go wherever I am - just add music! I use the app to lead a crowd sourced fitness class in Honolulu. Does everything I need it to do and is easy to use. This app would be perfect if developers could keep the voiceover from cutting out halfway through the workout. When it is working the voiceover tells you the exercise, time remaining etc and it is exactly what I need BUT it cuts out when I am at the hardest point in my exercise. Maybe it’s that I have music playing on another app - but that is (supposed to be) part of the functionality of the app! I’m using an iphone 6S and seconds pro. App cuts out with Apple Music, Netflix app, Hulu app, YouTube music. This app is well-designed, well-executed, intuitive, and full of features. It makes my gym sessions focused and time efficient, and it keeps me on track. My new trainer cost less than $5! Since downloading this I haven't had a bad workout. Get it. Now, get moving. Program is flexible reliable and gives one heck of a workout! Not starting up today but usually seems to work well. Finally a tabata that works with spotify! So happy this app works with Spotify and audible! Also creating your own work outs with the timer makes working out really easy and focuses what you are doing. Love it! Was working well for me but one day the haptics didn’t work, so now I’m trying to reset it and it’s a huge mess. Very unhappy. I use this app almost daily for HIIT. It's the best I've found, by far. Helps me keep my workouts fast paced. Great for HIIT workouts. Use this app daily for my ‘Morning Routine’. The voice announce or bell settings make this app perfect. Also made timers for Office Stretches, AeroPress Coffee, etc. Worse and worse with each update. Buggy. Overrun feature quit working in newest version. For $4.99, it should be better. There are free interval apps that actually work. Go get one of those! Gymboss! I use it every morning for PT exercises. Easy to program. I love this program. I mostly use the seconds timer so I customize workouts for my larger classes. The timer with the speech give me the freedom to let the people that know what they are doing to move forward with there workout without having to slow down the whole class for newbies, while at the same time giving me the freedom to work more one on one with new people to my class. The only thing I would Change about it is the voice, it would be nice if there were a voice option, meaning different voices, male, female, maybe even accents. Been using this app for over 6 years. It's awesome!! The best fitness app for home gyms and the self-motivated!! Seconds Pro timer is the best personal trainer app for serious athletes. 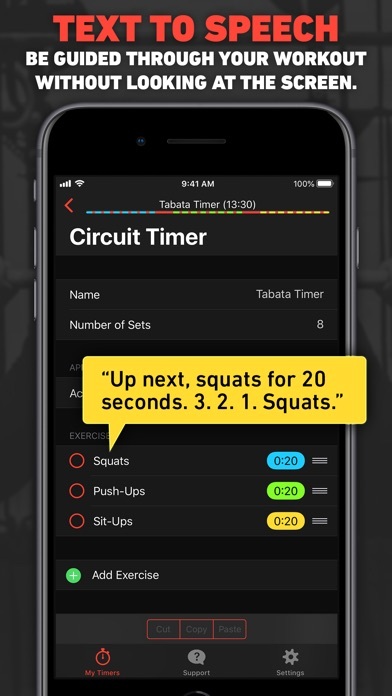 You can create custom workouts from a library of timers, each with a myriad of options. Advanced users can create completely customized timers. Perfect for Crossfitters, boxers and home gym rats! I use it daily and it’s fun and useful! The ability to set your timers is perfect for what I do! I use this for running intervals, a 5 minute plank routine. I have about about 20 different customized running workouts. The only reason I gave it a 4 is because I have one pyramid workout that will not work with music: if you play music, it will not beep, and I have to hold the phone in my hand and keep looking at it, which is a total pain! Otherwise, this is one of my favorite apps, that I use 5 days a week! Can’t say enough good things about this timer, and with every update, it just gets better. I've been using SecondsPro for over three years now as a group fitness instructor. It is customizable down to the interval level which is perfect as I like to design my own classes at a very granular level. It has also been completely reliable which is a must when you're standing in front of a couple dozen people expecting a professionally run class. Cut, paste and duplication features make it easy to build on timers you've already created and the export feature permits you to share timers. This is professional grade through and through. Highly recommended. I regret purchasing this App More than any other app. The process to creat a pace schedule is clunky and it will freeze your phone when you try to switch from one circuit pace to a different circuit pace. It won’t even leave Ram when you reboot your phone, or even if you shut it down and restart too soon. This means your unable to change pace mid-run unless you want to sit and wait 1/2 hour. Awesome. Very helpful. Not always looking at the clock. Can concentrate on the movements. Everything I need out of a timer...and way more that I don’t. Extremely versatile. Very convenient, easy to use, easy to create your customized workout schedule, and easy to select music for each stage of your workouts from your music library. When it’s time to work out...it just works! Awesome app for HIIT workouts! I have all my instructors download it so we can exchange workout ideas and maintain consistency. Also, the seconds pro team is great with any questions. Awesome tool for workout enthusiasts. Flexible and powerful. Does everything I need and more. Absolutely transformed my workouts. Simple, easy and customizable! I love it! Appreciate the freedom to make your own timed workouts or to use the suggested timings. Also like the variety of tones available to mark the timings intervals. Have used other timers. This is the one I stick with. Does everything, even the nuances, right. This is a great timer — not just for exercise, but for automating the timing of any routine, of any length or complexity. I use it for regulating my workday, which requires strict timing of a set-up period, a clean-up period, and multiple regular breaks. Simple and effective. I don’t personally need it to play a pre-set audio-playlist, but I can see how this could be useful for many people’s routines. I had some trouble upgrading from the free version to the Pro version, and again Restoring Purchases later. I found this was because I was working from the free version of the app, and that I could bypass the whole issue by deleting the free version and starting afresh with the Pro version (i.e. Downloading it as if it were a new app). Problem solved. (There are ways to back up and transfer your timers & settings when doing this, but I just set them up manually again in the Pro version.) I’m giving it 5 stars because I love the app, and because the customer service team (just a married couple) is committed and responsive and seems to care. They've built a great app. I’ve been using Seconds Pro for years. It’s customizable for more than just workouts. It helps me keep on track of my workflow almost on a daily basis. For such a small dev team they never cease to amaze. This is the best cost personal trainer I could ever have. So easy to create and store workouts and set up monthly routines. Plus it’s great to look at! Unmatched. Update feb 2018. Just another quick review to prop up my favorite workout app. Can’t imagine trying to stay fit and motivated without it. Super! Update October 2018. Still the best. Use it for all my workouts. Unmatched! The best timer app period! Thank you so much for this app which had revolutionized my fitness routines. I use it for complex physical therapy sequences and it’s so flexible in this regard. I also love the 3D Touch ability to start routines - so fast and easy. I love this app! I'm able to save and organize my timers in folders and by color. I use this app every time I do HIIT cardio or tabatas. Best interval timer out there! I started doing physical therapy and needed a few different timers. I downloaded and tried to use several, but this was by far the best. Save yourself the searching and heartache and just get this one first. I promise it’s worth the money!!!! I’ve been using this app for ages and absolutely love it. The customization, support and ease of use are unmatched. I’m an avid jump roper but now that I’m older I can’t jump for extended periods of time. I customized different HITT routines using Seconds Pro that allow me to continue jumping five days a week but for 30 second bursts. For me this timer is a lifesaver. Highly recommended! This is a simple app. I use it every day. I love the big numbers, voice callouts, and the interval timer. Love it! I use it everyday during my workouts. Who needs a personal trainer when you have Seconds Pro. This is definitely my favorite app! I keep all of my HIIT workouts on this app! I love how easy and convenient it makes everything. If you want to set up Bootcamp workouts this is the app. I used this app to create timers for all of my workouts. I do two different 6 min core workouts one on odd days the other on even, a stretching routine, a cardio workout and a strength circuit. After programming the timers I just start my music, start the timer and go, much better than the stop watch. It even says the name that you program for each exercise so you don’t have to keep track of where you are. I can also share timers I create on my blog that my followers can use for free. Great app, just what I needed. Update: After using this app for the last 11 weeks of my 12 week cycle I still give it five stars. Does everything I need, easy to create new timers as well as edit old ones. Not sure how to edit timers once saved. Not a user friendly app. Can do anything with this app. I love it. Really helpful for my exercises and have even used it as a drink timer for the kids to make sure they are drinking enough throughout the day. I use this app for my interval cardio before I workout. It's works while pandora or iTunes playlist which is also a big plus. Great job much appreciated. Don’t know what I’d do without this app. I store many different types of circuits/HIITs/Tabatas. It’s visually appealing and easy to use, very customizable. Highly recommend it, I’ve had it for many years and it’s never disappointed. I use this app every single day with my personal training clients and group exercise classes. It’s super easy to use, and the color coding is awesome. Highly recommend! Great app for HIIT. However, I gave 4-stars because the application will occasionally restart the timer mid-way through an interval. You can set up interval and compound timers to cover any type of workout from weights to running intervals (best with headphones for running). Play music or a book in the background. This is one if my must have apps on any iPhone or iPad. Oh, and you can sync your edits easily between devices. Any group of timed activities benefits, not just exercise. Pretty easy to use. The app voice is not loud enough and you cannot adjust it. I find it difficult to hear the verbal cues over the music. Helps me stay in my cardio range to lose fat. The ability to change screen colors for different intervals helps a ton! Great tool for workout and lots more. Solid App overall: Clean interface, ample controls. Would love to see Apple Watch Taptics control options integrated for timers, similar to how the native Breathe App uses Taptics for inhale and exhalation. Best app I ever use. I am a fitness instructor and this is the best app I ever use. If you want to listen to music while you work out, don’t use the audio features in the app; they don’t work and will sometimes play the same song on repeat indefinitely. Listen via iTunes in the background while using the app instead and it will work fine. The “text to speech” function does not work properly for the Apple Watch. Very frustrating. The first few exercises in a routine work fine and then the TTS function stops working. Doing interval training it’s frustrating to have to stop and look at the Watch each time to see the next exercise, and I can’t use my music. Please fix. Amazing. Love it. Can’t be beat! Great for timing kundalini yoga. This app works great for kundalini yoga because each Pose can have different timing. Great on split screen iPad to use music at same time. Love this app. It can be a little clunky getting your programs set up at first, but once you get the hang of it—it’s easy to use, its very versatile, and it’s FREE. I had this on my iPod for several years, un-updated, and loved it because it used real people for the voice prompts. That iPod broke and I downloaded the newest version onto my phone. I was disappointed to learn that somewhere along the way they got rid of that and use the Siri-like voice instead. App is still a win, just not the best. Finally a timer app that runs in the background. Is flexible enough for complex CrossFit WODs or simple timers. Pay the fecking money. It’s worth it. Seriously I was about to write my own app to do this. Now I do t have to, and it only cost me $5. Great workout App! Does everything that I need. Well worth the $! Use this regularly for my interval workouts. Like the flexibility and voice announcements for the exercises. Great for Crossfit, HIIT etc. It can be used for so many things. It’s a very stable and useful app. iCloud syncing a huge plus. This is my only go to for interval timing etc. I use it for planning rebounding classes. I can create distinct intervals to supplement bouncing with strength moves. I rely on adding music in each interval cause I’m here to sweat AND party!. I just wish I could do smooth music transitions like DJ Algoriddim. You can set the intervals and mini breaks for as much time as you want to. Also, you have your music play along with the app. This app is great. Hands down best timer app out there. With the compound feature I don't think there isn't a timed workout you can't create. Its easy to copy a set into another workout. Well done! My only complaint is that I lost a workout hitting back - lost 15 minutes of tedious typing. No confirmation that I was about to wipe out all my work. I have not found anything it won't do. I use it for daily neighborhood bootcamps, and it does the job nicely. Worth every penny! Though I HATE the new voice. WTH did you guys change it?! Bring back the lady!! I am relatively new to HIIT being part of a gym class for about a year now. Moving means losing my gym so I thought I could do this on my own and I researched to no avail. Until I found this app. It’s cumbersome because you have to set up all of your exercises but after that, it works quite well on shuffle. The audio is a little wonky (external works about half the time) but other than that I really like the app!!! Very complete app that I use for any of my runs with changing pace. 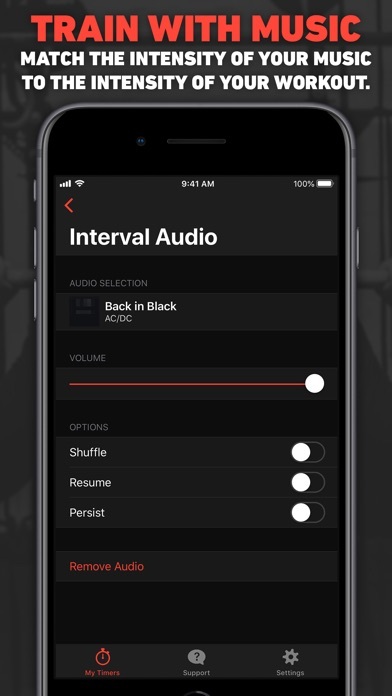 I would just love that it could connect the app to Spotify to use my playlists during my interval training more easily. This app has helped me get in shape and accomplish physical goals I never could when I was younger! Set it up to time my stretching exercises. Works well. I used to be able to share my built timer with other instructors. Now the copy and paste feature in a text or email just sends all the code! Please fix this! Love using this timer for all my HIIT fitness classes! I’d be lost without it! Easy to set different timers and I love the appearance of the display. Limitless possibilities to design your own workouts; helps you focus on workouts and not worry about the timer! I use Seconds Pro for all of my timed workouts and productivity. I love the voice prompts so that I don’t have to look at the timer. I like how easy it is to program customize. Everyone should get this app! The only problem is app doesn't play countdown sounds every time. 50/50 I get silence and I need sounds doing HIIT. I hate paid apps that nag you to leave a review so this is the kind review they get for doing that. This is a great app for creating customized routines. I use it for HIIT routines at work. I do back stretches as well. Highly recommended. The free version touts having all the features of the paid version...except the ability to save your workout. Older versions of this app have you limited access, but you could save. The current set up is the developers trying to strong arm you into paying $5 for a very simple app. I have 55 workout routines stored on Seconds Pro, from HIIT to stretching routines and everything in between. I have short and long workouts to fit my schedule. The timer keeps my workouts constant no time wasted. Love this app. You can build it to do whatever you want and it helps keep you focused on your work out. Of all the fitness gear I have, Seconds Pro has provided the most value. I use Seconds Pro alone and with our boot camp group. Great little tool. Intuitive. A fantastic value. I could have bought an expensive timer but why? This does all I need and, being audible vs primarily visual, we don’t have to stare at it. It’s pretty much dummy-proof. This is a must have for all fitness enthusiasts! Get it!!! I have been using this app (including prior versions) for more than a year. It's a perfect timer for HIIT sessions. This app needs a repeat option instead of copy/paste. Creating intervals gets complicated and I haven’t found a way to edit an exercise once created. I will probably delete this one and wish I hadn’t paid for it. It was great in the beginning but now the alerts do NOT consistently “sound” on my iPhone even though I checked and an alert option is selected. Frustrating. Tried to get help via Twitter and person helping me was rude. Developer continues to update and smooth out any bugs. Highly customizable to get u motivated and push through workouts. Well worth the money!! Love this app! I’m a fitness instructor and use it everyday for my classes and my own training. I like this timer app. But I bought the pro version and I can’t figure out how get my timers from the other version that I paid for to sync. There is no information on Reddit-which I hate as well! I find it very non-user friendly. Why can’t the developer just help? He used to help me when I first bought the app. I’m still not sure what the difference is between what I had before and this new one. This has to be in the top 10 of App Store apps. We use it very frequently for basketball practices and it helps keep us on task. The developers make frequent updates. Great job! I use it in my classroom to keep things on schedule. I love the text to speech option so that the timer announces what students should transition to! I have several exercise apps and they’re pretty good. What I really like about Seconds Pro is I can create my own workout routine. To me that makes it the best app out there. I use this app all the time for my fitness classes and even for personal use. But there are just a couple of things I find irksome: 1. I will create a timer for a class the morning before and when I go to use it later, it will often have reverted to an earlier version or completely deleted itself and I have no idea why that is happening. There isn't a (save) button so I just assumed that it live saves as I work on the timer, but it seems really spotty as far as what will actually be saved. 2. The very first time I used the "compound timer" and created sub timers, the program for some reason saved those timers and now any time I try and create the same kind of timer it auto populated with the settings from those first timers and I now have to completely delete out those timers before I can start with my new one. Maybe I have a setting wrong? But this creates tons of issues if I'm not super careful and change over all of the settings. Perfect and with so many options. This is a must have. Works well for creating routines. Very flexible to do what you need it to do. Easy to use, easy to create custom workouts and adjust sounds etc. I’ve been using it for maybe 4 or 5 years without problem, across multiple different iPhones. Easy to set up individualized timers. Great App for Interval HIIT Exercises! Great app and easy to use. Would recommend it for HIIT, tabata and other interval training programs. I been using it a few times a week for well over a year. This app has been my favorite workout app to use with my Apple Watch. You can create your own custom timed workouts and it will alert you through the watch when it’s time to change exercises. You can name and color code each individual exercise as well. A+! Great for both the beginner and the gym rat. I use it all the time no matter what I'm doing...for running, biking, kickboxing, or gym workouts. It has lots of ways to customize the timers so it works for a variety of applications. Love this app. Works well for a quick travel workout on the road. I like the ability to program several workouts to fit a changing schedule. I’m not sure when the voice changed, but I hate it! I’ve been battling a series of illnesses and was finally able to feel well enough to work out and when I heard the voice I INSTANTLY wanted to turn the app off. The app itself is awesome. I wish you could set up super sets though. But I’ve found a way around it. I just paid the $5 for this app and I can’t get it to work on my Apple Watch, I Gabe downloaded it, and it shows up on my watch, but when I click on it, it goes into the app, then shuts down and goes back to my watch face. I’ve used a lot of iPhone timer apps, none as good as Seconds Pro. And yes, the Pro version is worth the upgrade. I really enjoy using this app. I use it for almost everything including circuits, bike sprints and yes even brushing my teeth. One thing could make it better and that is an AMRAP timer. It would be great if there was a way to enter my AMRAP workouts without having to edit every time. This would also keep the screen from going dark every few minutes. Yes, I could use my phone timer and I do but the screen blacks out forcing me to waste precious seconds trying to bring up the work out and I can’t save the workout without putting a time to each exercise. Looking forward to an update soon! A great functional app with a friendly user interface that receives constant updates from its developer. I bought this 5+ years ago and was delighted to work with the developer when I found bugs. He was responsive and appreciative of my feedback. It’s great to see the app’s success and continued development/growth. Worth the investment. I tried many timer apps and Seconds Pro is easily my favorite. I use it to time jump rope and rowing workouts, to time speeches, and to track speaking time allotted to members in support group sessions. I found this timer to be the most flexible and easy to use. The updates continually improve an app I thought was great at the beginning. Most importantly to me, the app has given more flow — and hence fun and motivation — to the jump rope and rowing workouts mentioned above. Seconds Pro helped me improve my exercise routines, get into the best shape I’ve been in for more than a decade, and lose 20 pounds. Probably the most useful and meaningful app on my phone. This app is the kind of thing I wish I’d thought of and created. Although bugs do crop up on occasion, Daniel is very quick to squash them. This app is simply the best in its class. 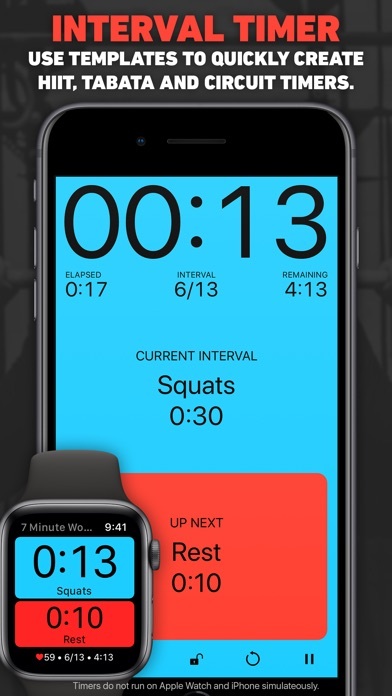 The Apple Watch app is a must-have for any type of circuit based training. Well done Daniel! The best interval timer app by far. Quite customizable. The Apple Watch app is stellar, syncs flawlessly, and makes my exercise routine a breeze. Highly recommended! This is a great app. Works well for several timed exercises, meditations, several languages, and streamed music. I have used this for several years and found it a worthy app for iPhones, iPads (both Mini and Pro). Several of my students have used this app in Android and MS. They have seen a few differences when compared with iOS. In sum, great app far more variations for adapting to your specific workout, but your imagination can go wild with the many ways use can customize your programmed workout. P. S. I love the new colors in iOS version. I’ve been using this app for YEARS. I’ve seen it change overtime. It’s been great, but as of late, I haven’t had great success with the Round timer. The music from my playlists doesn't sync up correctly. Sometimes the round will start and I won’t hear any music. I have to re-tap the timer to get the music to chime back in. This never used to happen so I’m hoping it’s only temporary. Seconds Pro helps me to add my favorite HIIT workouts and keeps me on track! Super simple yet highly effective. Try it out! This app can be customized to fit just about any type of workout routine. It takes a few minutes to get the hang of the different types of timers and how to use them. However, it’s worth it because of the format flexibility you gain. The music selection and timing is also very customizable. Worth the money. I’ve been using second pro for over 5 years. I have a ton of different workouts with music saved on the app. It has been my most consistent workout tool I own. All my workouts are time specific including the rest in between sets. I never have time to mess around. As a result, my workouts are grueling but effective. I even design workouts with my seconds pro app. If you have a goal and need to utilize your time efficiently, use this app and go do it, no excuses. Matched with a good workout plan and diet, you’ll get the results you want. Great app for timing all sorts of workouts. I had to read the manual some to figure everything out, but that is only because this app is so powerful. My daughter is getting in shape to apply to a service academy and we are using this app to train for the various tests. The ability to customize to whatever I need is absolutely awesome. However, very disappointed that in order for me to exit a completed workout to go back to the main menu on my Apple Watch, I have to uninstall and reinstall it. At the end of the workout, it has a “done” button on he watch, but when I click it, it says unable to save and takes me back to the end of workout screen. I’ve tried closing the program on my watch and when I reopen it (even the next day) it’s still on that same end of workout page. The only way to get out off that page is to uninstall. Kinda defeats the whole reason I paid for the app. Always is. Always has been reliable. I will continue to use this app as long as it runs as smoothly as it has since day 1. This is the most flexible timer within ITunes. Tabata style, Circuit, Custom, Compound ... just works. I purchased Pro version in order to save my custom Timers. Only point of improvement is the ability to share my Timers among all devices, ie my iPads, iPhone etc. Now you have to recreate the Timers within each device. App uses iCloud for backups but not for synchronization. I hope that feature is coming soon.